Published Oct 2, 2018 By Julia 1 CommentThis post may contain affiliate links. 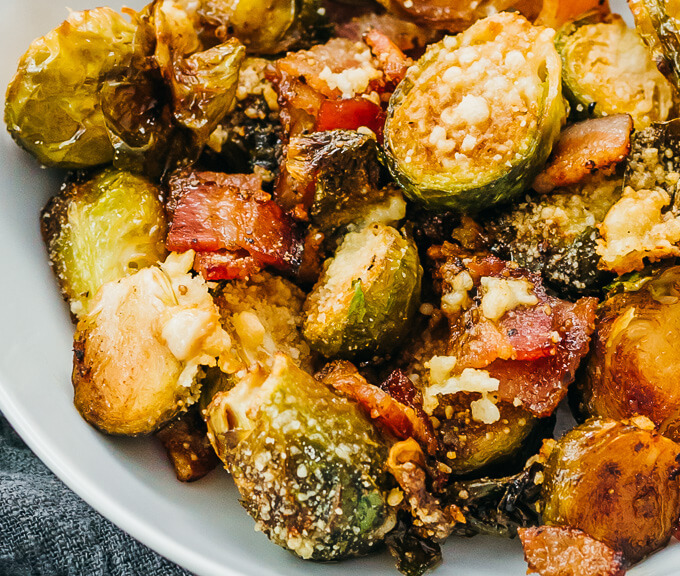 Addicting oven-roasted brussels sprouts baked with bacon, garlic, parmesan cheese, and balsamic vinegar. 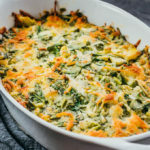 A comforting low carb and keto dish for the colder months and holidays. Brussels sprouts are one of my favorite cold weather vegetables. 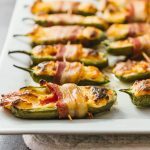 They can taste horrible when insufficiently cooked, but are ridiculously good when cooked right and paired with complementary ingredients (in other words, bacon!). I prefer baking them in the oven vs. sauteing, so they get that nice roasted flavor and texture. That’s why I cook this Bacon Wrapped Brussels Sprouts Appetizer in the oven every Thanksgiving. When I’m really short on time, I use my pressure cooker to make Fast Instant Pot Brussels Sprouts. You’ll find these brussels sprouts simple to make. Trim and toss them with bacon, garlic, olive oil, and seasonings before spreading them out on a baking sheet. Bake, toss with balsamic vinegar and parmesan cheese, and bake more until tender. I can’t wait to make these again. New to cooking with brussels sprouts? First, wash and remove any bad leaves. Second, trim by cutting off the bottom core. Then cut each sprout in half by slicing through the core. Take a look at the photo above to see how they’re supposed to look after trimming and halving. You’ll probably end up with lots of loose leaves. Don’t discard them; loose leaves crisp up beautifully in the oven (brussels chips?) and are delicious crunchy things that you’ll love. 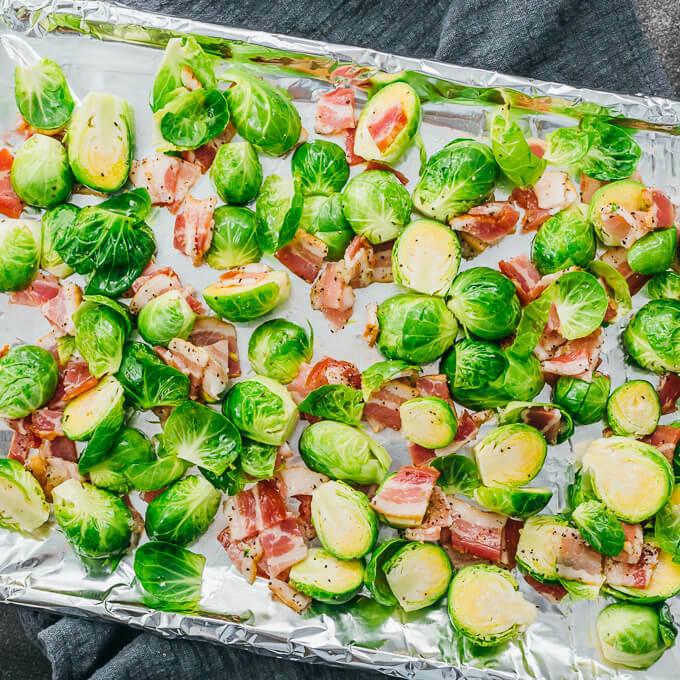 Make sure the brussels sprouts and bacon are evenly and well spread out on the baking sheet. It’ll take much longer to bake them if the ingredients aren’t in a single layer. Don’t add the balsamic vinegar and parmesan cheese at the same time as the brussels sprouts. They require a shorter baking time so they’re not added until later, in the second-to-last step of the recipe. Ovens can vary a lot, and the time estimates listed in the recipe are only a general guideline. Monitor the food frequently, and it’s done when the brussels sprouts are tender and darkened, the bacon is crispy, and the balsamic vinegar looks “baked in.” Avoid baking too long and burning the food. 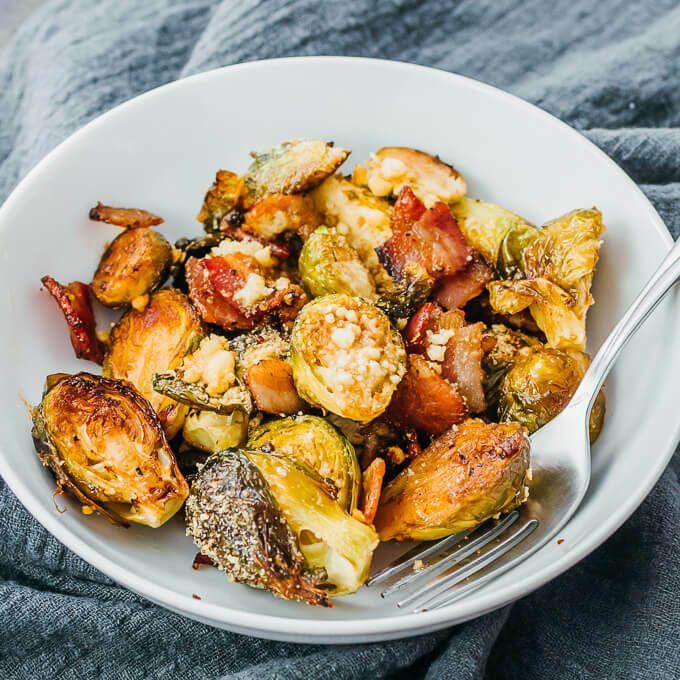 Addicting oven-roasted brussels sprouts that are baked with bacon, garlic, parmesan cheese, and balsamic vinegar. 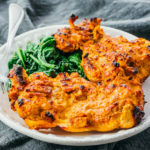 A comforting low carb and keto dish for the colder months and holidays. 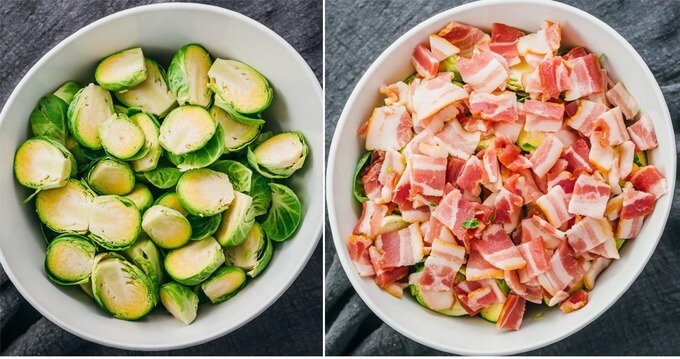 In a large mixing bowl, toss brussels sprouts and any loose leaves, bacon, garlic, olive oil, salt, and pepper until well-mixed. 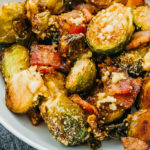 Drizzle with balsamic vinegar, and toss or flip the brussels sprouts and bacon. Evenly sprinkle the parmesan cheese on top. Bake for another 10 minutes or until the brussels sprouts are tender. 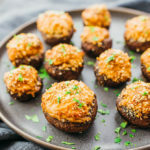 This recipe yields 5.5 g net carbs per serving (1/4th of the recipe).